DECA Makes it to Regionals! 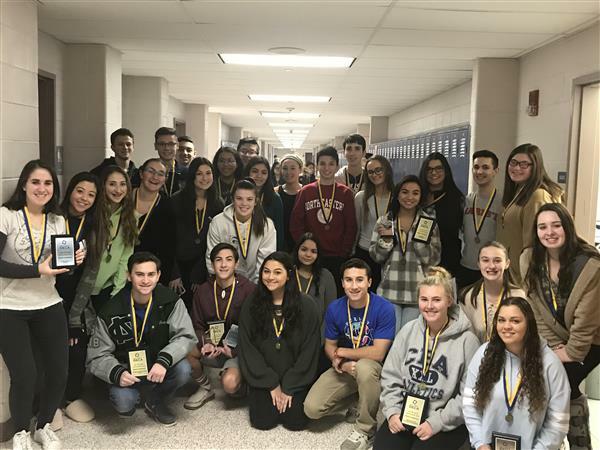 The DECA regionals event took place on January 3rd, at Kean University. Considering that it was a regional event, all members of the club were able to participate. Those who attended had to perform a roleplay situation, assuming the role of an individual in their desired line of business. The selection of business options ranged from Hospitality Services and Management to Principles of Marketing. These became the contest choices. The selection in which one can choose from was very diverse. Because of the differing contest choices, people had to endure different types of roleplays. For instance, there were roleplays that required one person and others that required two people. These were known as individual events and team events. In a individual event, a single person goes into a prep room for 10 minutes where they must read the situation given to them and determine how they are going to handle it. Then the person has 10 minutes to present to the judge located in the next room. These participants must complete two roleplays. As for the team event, it is very similar except the team of two has 20 minutes of prep time, 20 minutes to present, and only has to do one roleplay. In contrast, there are also other roleplays where prep time is not given at the event but at home. This is when participants choose to write a paper. Unlike the individual and team events, the paper writers are allowed to select a problem and solution beforehand and then write a lengthy paper about it. Therefore, at the regional event, paper-writers came prepared with their paper, a poster to serve as a visual, and presented the content in front of their judge without additional prep time at the event. After each person completed their roleplays, they were given the opportunity to roam the Kean University campus, making it a priority to stop at the Starbucks. Along with the roleplays, members of the club must take a test to determine if they are going to States. Because the test was held in early December, soon after the regional event was done, participants discovered whether or not they qualified for States. The members who qualified are: Trever Ballingall, Emmanuel Meshoyer, Kristina Nappi, Bradley Polkowitz, Kristen Villaverde, Raniya Jesani, Sara Albury, Lily Sandidge, Connor Peterson, Alyssa Nath, Sophie Divino, Ellie Petroutsas, Oliva Margolin, Eden Dubrovsky, Julia Comi, Kristian Hartman, Erin Hogan, Jared Katz, John Stracquadanio, Anastasia Lyristis, Dana DiBella, Michael Boliver, Megan Clarke, Elizabeth Borao, Christina Borao, Julia Stracquadanio, Stephanie Mondella, Anthony Mallozzi, Gabby Pellecchia, Many Pelensky, Eliana Joskowski, Jordan Freeman, and Parker Ballingall. The States event is going to be held in Atlantic City on March 4-6. The event will operate very similar to regionals. Participants must take a test and perform a roleplay situation but are granted large quantities of free time. After the testing and roleplays are done for States, it will then be determined who progresses on to Nationals. Congratulations to all who qualified! Good luck!